Dine & Dish Nation Host Kam Carman has just what you need to warm up you and yours during the coldest winter nights! I got this recipe from The Inn at Southwest Bed and Breakfast in Maine and have served it at many a dinner party and for the holidays during the past few years. It is drop dead delicious, but is super easy to make. You’ll want to lick the pan, I swear. In a medium skillet, melt butter over med-low heat. Add the sugar and the extracts and stir until the sugar is dissolved. (I like to use my whisk.) Remove from heat and slice bananas into sauce and stir gently. 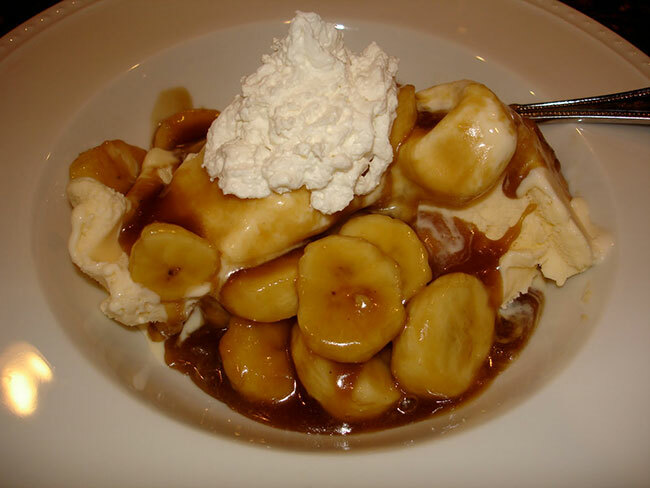 Scoop ice cream into a small bowl and spoon the banana mixture over the top. It doesn’t really need it, but you can top with a bit of whipped cream, if you want. Sprinkle with a bit of cinnamon and serve immediately. Delish!